Background reports have been ordered on a teenager convicted of smashing up his mother’s home and then getting involved in a violent confrontation with police. Lawry Edwards, 18, admitted shouting and swearing, uttering threats of violence, toppling over a fridge and breaking ornaments and other household items, causing damage to doors and walls and pulling fittings from walls and ordering his American pit bull terrier to attack police officers at the property in Leslie Place, Selkirk, on October 21. He was taken to the Borders General Hospital at Melrose that day for checks and was involved in a struggle with police officers there too. Tessa Bradley, prosecuting, told Selkirk Sheriff Court that Edwards was living at his mother’s home at the time and the relationship was “somewhat fraught” in the days leading up to the incident. She said: “There had been issues regarding his consumption of alcohol and, it is suggested, other substances. “On the Saturday, there was an an angry exchange between the accused and his mother. “She decided to leave and go to her partner’s home. “At 4.30pm on the Sunday, she came home and he was not there. “Later on, he was brought home by his two friends who had put him up the night before. He was under the influence of alcohol, and his friends were fed up with him and decided to take him home to allow him to sleep it off. “He tried to make it up with his mother, but she did not want to speak to him and ignored him. “This enraged the accused, who toppled over a fridge and threw things at the television. “Mrs Edwards was fearful for her safety and called the police. The call handler could hear what was going on, and the mother was instructed to remove herself from the premises for her own safety. “The phone call was 18 minutes long. “Mrs Edwards was kept on the phone until police officers got there. 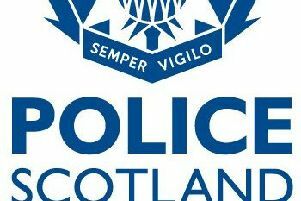 “Officers made their way from Hawick a short time later and found an unlocked front door. They went in and found fixtures and fittings lying all over the hallway and they heard a male voice shouting from upstairs. “He was shouting aggressively, saying they had no right to be in the house. He shouted ‘get out of my house or I will punch you’. “He appeared down the stairs in an agitated state. The depute fiscal said that Edwards was warned they would deploy the pepper spray, and eventually they had to after he threw a mirror across the room. The spray hit the mirror, and a second attempt was made with the incapacitant. The court was told that Edwards continued to struggle with officers and he was subdued on the ground. At that point, he shouted at his dog to attack the officers, but the dog did not respond and “seemed to be alarmed at what was going on”. Ms Bradley said that Edwards was taken to the Borders General Hospital for an assessment after the deployment of the pepper spray, but in its accident-and-emergency department he started shouting and swearing and began to struggle again with officers and eventually had to be removed. Sentence was deferred on Edwards, of Bleachfield Road, Selkirk, until February 11 for reports. His bail conditions include not entering the property in Leslie Place.